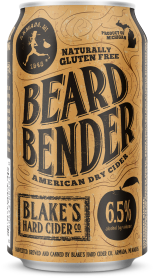 Blake's Beard Bender is a 100% natural hard cider. It's funny when nothing's added you taste the true characteristics of the apple. Not for the faint of heart. Beard Bender packs a punch not expected from hard cider. Derived from a variety of Bittersweet and Bittersharp apples. Beard Bender is tart, crisp and amazingly drinkable. And, of course, 100% grown at Blake Farms in Armada, Michigan.